Their numbers have dipped since most of them have now reached saturation, say govt officials. New Delhi: The share of minority communities in the total number of houses sanctioned each year under the Modi government’s flagship programme, Pradhan Mantri Awas Yojana (Gramin), has been witnessing a steady dip, government data shows. PMAY (G) is crucial to the BJP’s electoral game-plan as it prepares to fight the upcoming assembly as well as Lok Sabha elections on a welfare, pro-poor plank. 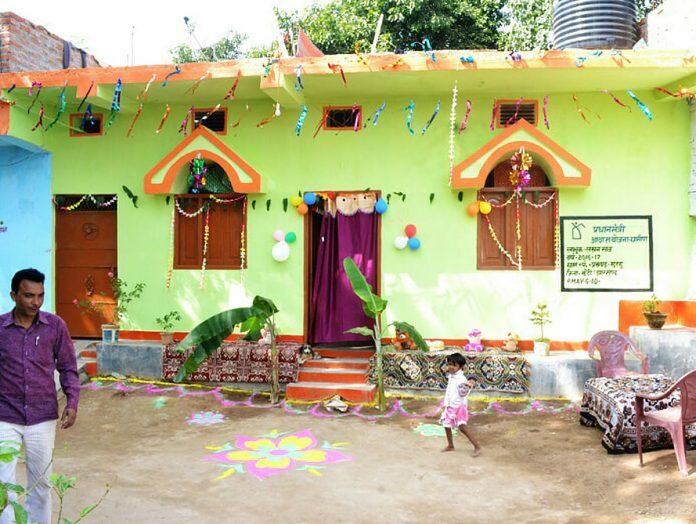 Previously known as Indira Awas Yojana, the scheme was refurbished by Prime Minister Narendra Modi on 1 April 2016, promising to focus on the marginalised. However, this year so far only around 9 per cent of houses allotted under PMAY (G) have gone to those from minority communities, latest government data shows. The number is the lowest in the past decade or so. This shows a decline from 2017-18 when 11.7 per cent of houses went to these communities, and 2016-17 when the figure was around 12 per cent. The figures are for all central rural housing schemes but the proportion of others besides IAY earlier and PMAY now is minuscule. According to officials in the ministry of rural development, which oversees the scheme, the numbers of minorities with respect to sanctions have dipped since most of them have now reached saturation. In 2015-16 as well as in 2014-15, around 14 per cent of all rural houses sanctioned went to minorities. It was 12 per cent in 2013-14, 14.5 per cent in 2012-13, 13.7 per cent in 2011-12 and a peak of 15 per cent in 2010-11. Six religious communities are classified as minorities in India, with Muslims being the largest. As per the 2011 census, Muslims constitute 14.2 per cent of the total population, and the remaining minority communities – Sikhs, Jains, Christians, Parsis and Buddhists – account for around 6 per cent. According to officials in the ministry of rural development, those from the more deprived sections such as minority communities are given priority in the permanent waiting list, and hence, get houses earlier. “Since most of them have now reached saturation, their numbers with respect to sanctions have dipped, just like the case for women, SCs, among others,” said a senior ministry official speaking on the condition of anonymity. Ministry sources also say using the Socio Economic and Caste Census (SECC) to identify beneficiaries has meant more effective, streamlined targeting, as against the greater ad-hocism possible earlier. The scheme has an immediate objective to cover one crore households living in kutcha/dilapidated houses by 2018-19. This has been one of the Modi government’s most favoured programmes, as well as one of the most efficiently implemented, witnessing a sharp spike in the completion of houses under it since it was re-structured in 2016, nearly doubling the output. During his interaction with PMAY beneficiaries through video-conferencing in June this year, Modi had said the aim of the scheme was to ensure “more women, differently-abled sisters and brothers, SC, ST, OBC, and minority communities get access to housing”. Government data also shows that while the share of scheduled tribes in rural houses allotted by government has been growing, that of the scheduled castes has been falling. The figure for SCs, which mostly remained above 35 per cent until 2015-16, came down to 32 per cent in 2016-17, falling further to 26.5 and 25 per cent (so far) in 2017-18 and 2018-19 respectively. In the case of SCs, coverage saturation is a possible reason for fewer houses being sanctioned to the community with time. Earlier this week, ThePrint had reported how the number of houses in rural areas sanctioned in women’s names has seen a sharp dip since PMAY (G) was brought in during 2016-17.